Notes: Rainford Village station was situated on the St Helens Canal & Railway Company’s (SHC&RC) St Helens – Rainford Junction line which opened on 1 February 1858. The line was in effect a 6-mile 7 chain northern extension of the SHC&RC Widnes – St Helens line that had opened as the St Helens & Runcorn Gap Railway on 1 February 1833. The SHC&RC obtained an Act to build the line on 4 August 1853 and had the support of the East Lancashire Railway (ELR) who agreed to build a line from Rainford to Ormskirk with the aim of ultimately reaching the seaside town of Southport. At Rainford Junction, just to the north of the village, both the SHC&RC and the ELR lines connected with the Lancashire & Yorkshire Railway (LYR) Liverpool and Wigan line. The ELR line opened from Rainford Junction to Ormskirk on 1 March 1858 and was never extended towards Southport. Rainford Village opened as simply Rainford along with two others (Gerrards Bridge and Moss Bank) on the 3 March 1858. The LYR opened a new station called Rainford Junction on its line (replacing its original Rainford station which had been further west). 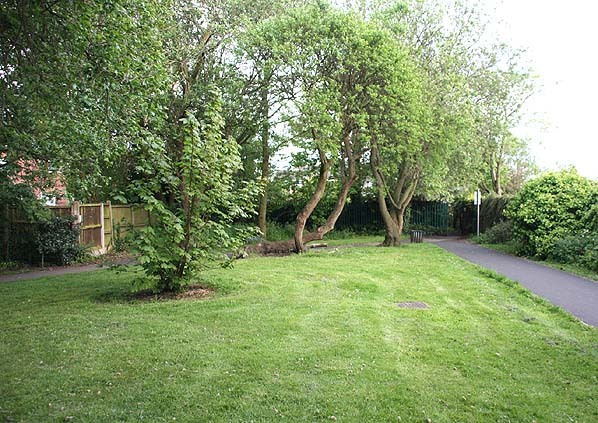 The station was located on the east side of the village on the north side of Cross Pit Lane which passed over the line by means of a level crossing. When the line was opened it was a single track railway and Rainford was provided with a wooden platform on the east side of the line. A wooden building was provided which had a curved roof that extended over the platform to form a canopy. Goods facilities were provided at Rainford Village. They consisted of a yard with two sidings located west of the line adjacent to the passenger station. In November 1861 the SHC&RC renamed the station Rainford Village but the 1864 timetables still referred to it as simply Rainford. On 1 August 1864 the SHC&RC was taken over by the London & North Western Railway (LNWR) but the LYR maintained its running rights over the line between Rainford Junction and St Helens. In 1890 the line between Rainford Junction and Gerrards Bridge was doubled. The original line became the down (St Helens direction) and Rainford Village was rebuilt. It was provided with two brick built platforms and a new LNWR style building that was located on the up platform (Rainford Junction direction). Just to the north of the station the line became single track again. As part of the doubling of the line a new signal box was opened at Rainford Village. It was an LNWR type 4 box with a brick base and wooden upper cabin. The box had a 20 lever frame and it was located at the south end of the up platform adjacent to the level crossing. The December 1895 timetable showed Rainford Village as having 7 up and 8 down services Monday-to-Friday. There were 2 extra up and 1 extra down trains on saturdays and 3 trains in each direction on Sundays. The LNWR introduced a rail-motor service onto the line on 1 October 1911. An additional halt was opened at Old Mill Lane. It seems likely that an actual rail-motor was not used on the line as it would have been inadequate for the services and instead push-pull trains using LNWR-built 4' 6'' Webb 2-4-2 tank engines were used. Both the LNWR and the LYR operated a couple of trains between St Helens and Ormskirk but they all called at Rainford Junction station where a reversal was necessary. On 1 January 1922 the LNWR and the LYR merged and a year later on 1 January 1923 became part of the London Midland & Scottish Railway (LMS). This brought the entire route from St. Helens to Ormskirk under the direction of one company for the first time but that did not alter the pattern of services which remained as they always had with most of the St. Helens line services and Ormskirk line services terminating at Rainford Junction. In 1925 the LMS introduced ex-LNWR 5'6'' 2-4-2 tank engines onto the passenger service that had been converted for vacuum push and pull operation. During the Second World War passenger services were reduced and they never recovered to their pre-war levels. The LMS summer timetable for 1947 showed 8 trains in each direction on Monday-to-Friday as shown in the table below. On Saturday there were 3 extra trains in each direction. Seven of the weekday down trains had connected with Ormskirk services. On 1 January 1948 Rainford Village became part of British Railways London Midland Region (BR[LMR]). The summer 1949 timetable showed only 6 trains in each direction Monday-to-Friday although on Saturdays the service increased to 10 trains each way. With such a poor level of service BR[LMR] proposed the passenger service for withdrawal and the last trains ran on Saturday 16 June 1951. 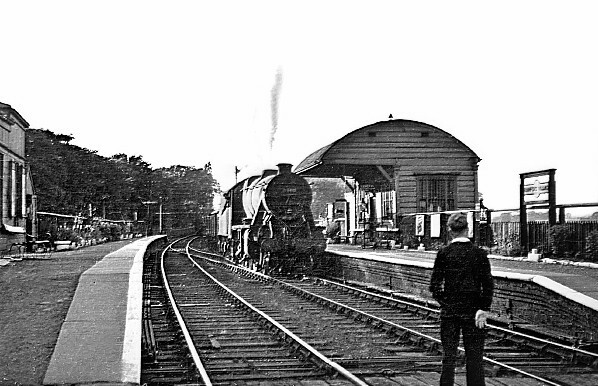 On Monday 18 June 1951 Rainford Village closed to passenger services. The Rainford Junction – Ormskirk service continued to run until it was withdrawn on 5 November 1956. The St Helens – Rainford Junction line remained busy with freight services and during the BR[LMR] era many coal trains from the Wigan coalfield to Garston Dock ran along it. 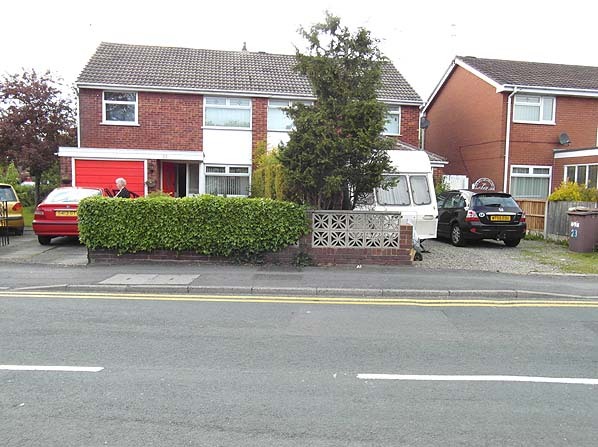 Passenger excursions and diversions also passed through Rainford Village during the 1950s and early 1960s. Under the Reshaping of British Railways report of 1963 (Beeching Report) the St Helens – Rainford Junction line was seen as a duplicate route and was proposed for closure. 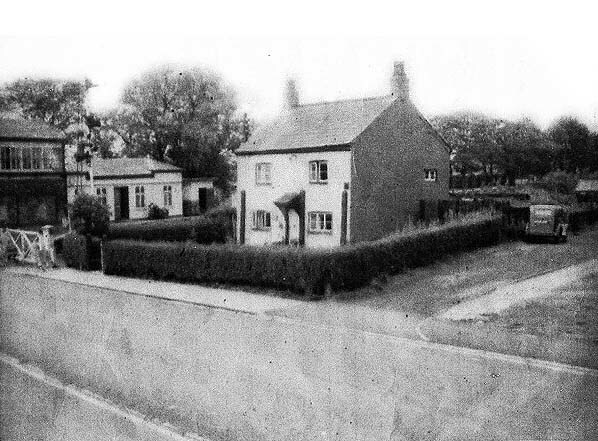 Rainford Village station closed completely on 6 July 1964. The station building on the up platform was demolished shortly after closure. The line between Rainford Junction and the site of the first Rookery station was mothballed bringing an end to through services. It remained mothballed until Saturday 11 March 1967 when it was officially closed. Rainford Village signal box closed that day but it had been out of regular use since 1964. It is not known if any trains ran between Rainford Junction and Rookery in the mothballed period. The station languished in a derelict state until the late 1960s after which it was demolished and its site was developed with houses. Tickets form Michael Stewart route map by Alan Young. 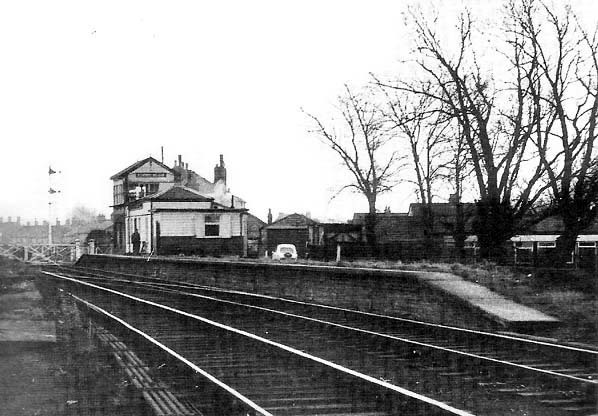 Looking south at Rainford Village station in the late 1940s. The station appears to be well kept and even has floral displays on both platforms. At the far end of the up platform (right handside) can be seen the booking office and beyond it the Rainford Village signal box. To the left on the down platform is the original station building from the period when the line was a single track railway. Rainford Village station shown on a six-inch scale map from 1858. At that time the line was a single track railway throughout. Rainford Village shown on a 1:2,500 map from 1908. Rainford Village station after closure to passenger services but when still open for goods in 1960 shown on a 1:2,500 scale map. 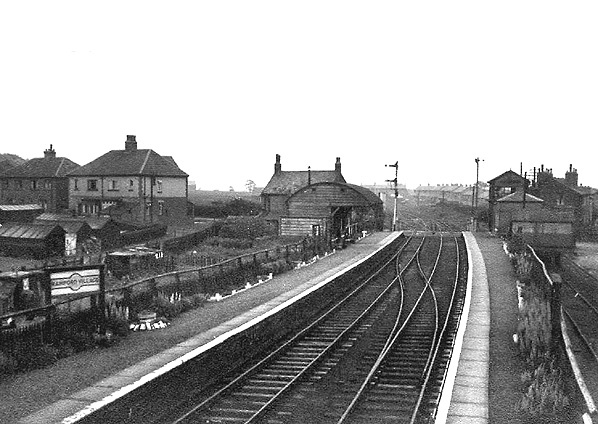 Looking north at Rainford Village station in 1949. A goods train is seen passing south. It would have just come off the single line section and the signalman is seen waiting to collect the token. 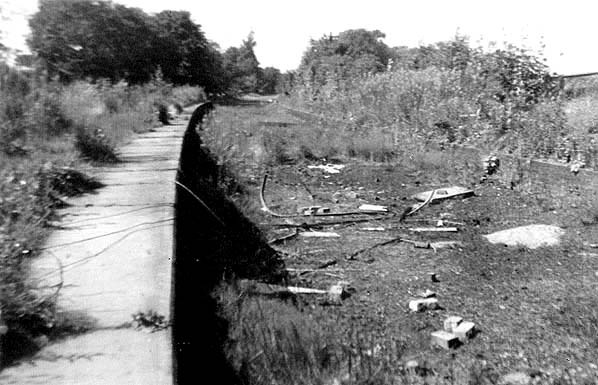 Looking south from the northern end of the down platform at Rainford Village in 1961. A solitary BR 16 ton mineral wagon stands in the goods yard. 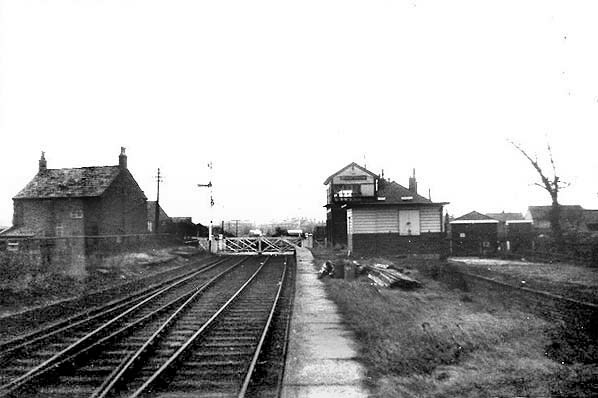 Looking south along the up platform at Rainford Village station from the northern end of the station in March 1965. The goods dock is seen on the right. Regular traffic had ceased by this time. 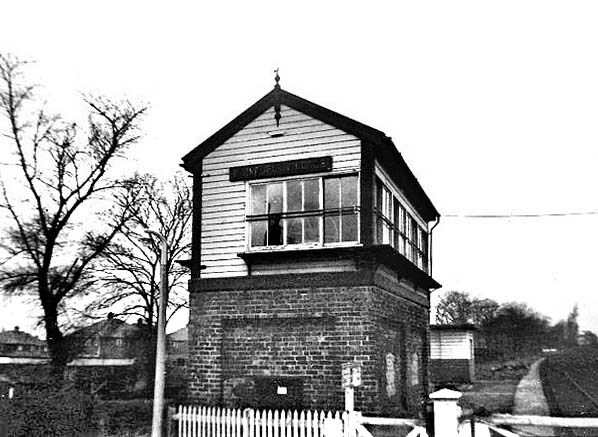 Looking north at Rainford Village station signal box in March 1965. Behind the signalbox can be seen the stations up platform. The signalbox controlled the section of line that went from double to single track beyond the northern end of the station. It also controlled the level crossing and access to the goods siding seen in the picture above. At this time the line was mothballed. Rainford Village station looking north towards Rainford Junction from the down platform in 1968. Looking north at the site of Rainford Village station from the site of the level crossing on 21 May 2015. A view looking south at the site of Rainford Village station on 21 May 2015.